IT Transformation enables IT to become a service-centric partner to the business, helping deliver new products and services more quickly. An IDC study of 16 global companies shows the financial benefits. Today’s always-on business environment relies on IT to deliver a competitive advantage. 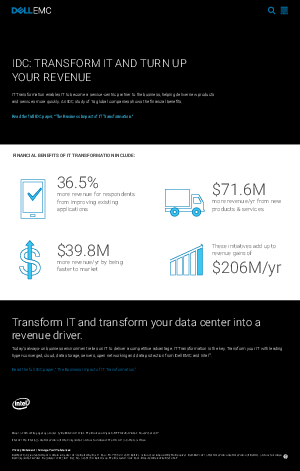 IT Transformation is the key. Transform your IT with leading hyper-converged, cloud, data storage, servers, open networking and data protection from Dell EMC solutions powered by Intel®.